Egypt's persecuted Coptic Christian minority has been nominated for the 2018 Nobel Peace Prize, reportedly the first ethno-religious group given such an honor. While the Norwegian Nobel Committee doesn't release the names of nominees, the charity Coptic Orphans announced the nomination on their Facebook page in a post from Tuesday, noting that they were nominated for their refusal to retaliate against recent acts of anti-Christian violence. There are 331 nominees for the Nobel Peace Prize this year, which includes 216 individuals and 115 groups, making it the second highest number of candidates since 2016, when there were 376. The recipient of the Peace Prize will be announced on Friday, Oct. 5, with the official award acceptance ceremony being held in December. In a statement released in response to the news, Coptic Orphans noted the persecution that the Church has endured in Egypt since 2011, when the "Arab Spring" protests led to the overthrow of long-serving dictator Hosni Mubarak. "According to a 2018 report by the Christian charity Open Doors, Christians in Egypt face 'unprecedented levels of persecution.' 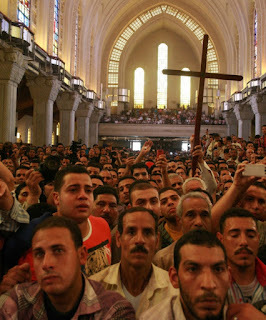 Last year, according to the report, 128 Egyptian Christians were killed for their faith and more than 200 were driven out of their homes," the organization said. "Despite this, Coptic Christians have consistently refused to retaliate and continue to practice peaceful coexistence." Over the last few years, Coptic Christians have been subjected to numerous brutal attacks and church bombings carried by Islamic extremists. For example, in May 2017 Islamic extremists attacked a group of Coptic Christians on their way to a monastery south of Cairo, killing around 30. In October 2011, over 20 Copts were killed and around 200 injured in violent clashes after the Christian minority was protesting increased persecution of churches. Earlier this year, a female Coptic journalist named Engy Magdy wrote an op-ed published by the Brooklyn-based Catholic news website The Tablet documenting how life for Christian women in Egypt was "hell." "To be a woman in a country where most of her people see women as a disgrace, and at best look at her from a sexual point of view, it is a heavy burden, but even worse when you are a Christian woman," wrote Magdy. "Most Muslim women in Egypt wear a hijab and therefore, the others who do not wear it are most likely Coptic. ... This means that the Egyptian man thinks he has the right to harass her, simply because he sees her as a whore and a disbeliever."